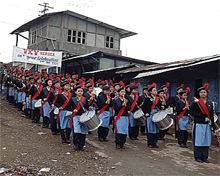 Arunachal Pradesh is predominantly a tribal state and hosts many local scheduled tribes. About two thirds of its population belongs to scheduled tribe - from 26 major tribes and more than 100 sub-tribes. The different tribes have their own dialects, cultural heritage and follow distinct languages, costumes and festivals. The varied culture of the tribes is reflected in their bamboo, wood and cane handicrafts; carpets; traditional ornaments andpaintings. Community living with strict adherence to local beliefs, custom and social norms has been the hallmark of Arunachal tribes who are yet to come out of a primitive lifestyle. While efforts are on by the state government to provide modern education and usher in social infrastructure to improve their lifestyle, extra care is also being taken to preserve their tribal heritage and expand their numbers as they add vibrancy to the state. 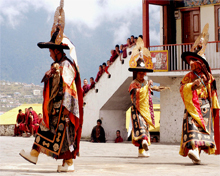 Major festivals observed in the state are Mopin, Solung, Nyokum, Lossar, Si-Donyi, Boori-boot, Dree, Reh, Sipong Yong,Chalo-loku and Kshyatsowai. Trekking, river rafting, archery, mountaineering, fishing and angling are the prominent sports in Arunachal Pradesh. Sports infrastructure available in the state includes the Rajiv Gandhi Stadium in Naharlagun, Nyikum Niya Indoor Stadium inNirjuli and Nehru Stadium in Khonsa. 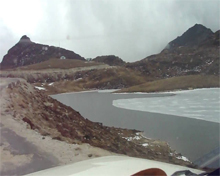 The key tourist destinations are Parasuram Kund (Lohit), the Namdapha National Park (Changlang), the Ita Fort andJawaharlal Nehru State Museum (Itanagar), the Tawang Monastery (Tawang) and the Sela Lake (Bomdila). In an initiative to develop the tribal community, 630 tribal students benefitted from various bachelors, PG and Commerce courses in Chandigarh affiliated with Punjab Technical University for undergoing vocational and professional training courses during 2012-13. The government has plans to increase the number of tribal students getting trained in Chandigarh to 1,000 in each year. Arunachal has become the first state in the country to launch a web-based educational programme for all schools in collaboration with Google Inc. This digital outreach will help the state to further make education a lively tool of interest to tribals who are expected to come forward in large numbers for school enrolment. The state has 20 colleges and 12 standalone institutions, with average enrolment of 1,943 students per college and 75 students per stand-alone institution. There is a proposal to establish five degree colleges, seven new polytechnics, and five new technical/professional colleges in the state. Moreover, the government plans to setup two new model colleges at Tirap and Longding districts to improve the education sector. By the end of the 12th Five-Year Plan (2012-17), the state government plans to raise the literacy rate in the state to 80 per cent from the present 65.4% as per 2011 census. Under the Sarva Shiksha Abhiyan (SSA), the government released US$ 4.8 million as salary for teachers in the SSA programme in January 2014 and is further expected to release US$ 29.0 million. To support its rural population, Arunachal has a three-tier public healthcare infrastructure comprising sub-centres, primary health centres and community health centres. In addition, there are district hospitals in mostdistricts.For 2012-13, the government set aside US$ 73.0 million forhealthcare. The Rashtriya Swashth Bima Yojna benefitted nearly 300families in 2013, as each family was aided with nearly US$500 during the year. For treatment of diseases and accidents, the stategovernment has launched the 'Chief Ministers UniversalHealth Insurance Scheme' and appealed to the people toavail of the same instead of applying for relief from ChiefMinister's Relief Fund (CMRF). Many people have expressed reservations over the proposal to remove the Inner Line Permit (ILP) for those who board the Rajdhani Express with a valid ticket from the national capital to Naharlagun near Itanagar. 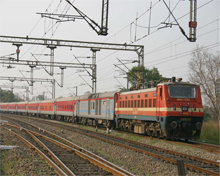 The existing train service between Naharlagun and Harmuti in Assam was stopped after various NGOs opposed the service expressing concern over the sudden increase in the influx of outsiders. Even though Rajdhani service is being welcomed as a sign of economic development, the move do away with the ILP has not gone down well with the Arunachal people. Many Arunachalees see this move as a long-term policy of Centre to remove ILP system and ensure the gradual migration of mainland Indians into Arunachal to counter the Chinese claim over the state. From another perspective, there is always a comparison with the comforts enjoyed by the people on the other side of the border as Tibetans are flooded with a host of infrastructure facilities with modern roads, railways and other amenities by the Chinese government. Whereas most parts of Arunachal are yet to get basic facilities like proper roads and sanitation with locals having to put up with rudimentary conditions for living. Hence, both the state and central governments have an onerous task to win back a section of Arunachal people who feel alienated from the mainland as they have been neglected for long with no development taking place in their villages.